What Type of TMS Solution Is Best? Shippers use transportation management systems (TMS) to reduce freight costs while maintaining or improving service levels. In recent years, a new style of TMS has emerged. 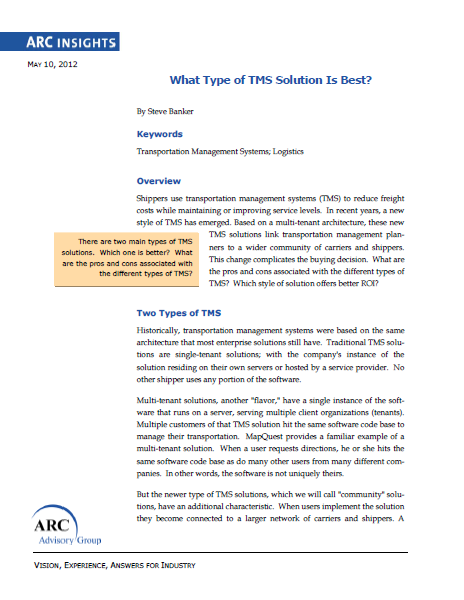 Based on a multi-tenant architecture, these new TMS solutions link transportation management planners to a wider community of carriers and shippers. This change complicates the buying decision. What are the pros and cons associated with the different types of TMS? Which style of solution offers better ROI?